Engineers: Arjen van der Schoot, Rahul Atul Manthalkar. 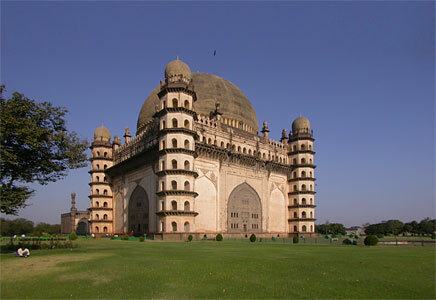 Gol Gumbaz is the mausoleum of Muhammad Adil Shah II (1627-57) of the Adil Shahi dynasty of Indian sultans, who ruled the Sultanate of Bijapur from 1490 to 1686. The structure consists of a massive square chamber measuring nearly 50 m on each side and covered by a huge dome 37.9 m in diameter making it the second largest one in the world which is unsupported by any pillars. The acoustics of the enclosed place make it a whispering gallery where even the smallest sound is heard across the other side of the Gumbaz. 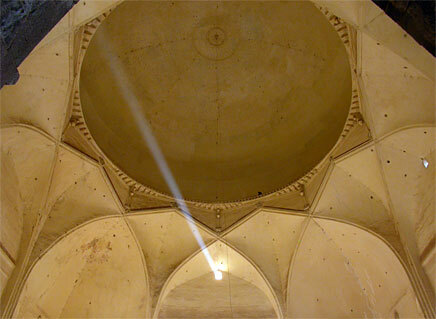 At the periphery of the dome is a circular balcony where visitors can witness the astounding whispering gallery. Any whisper, clap or sound gets echoed around 10 times. The ground level samples ring on for a staggering 25 seconds. Gear: DPA 4006 omni directional mics and tannoy speaker. More about this expedition (audio & video).